To Elate, or not To Elate! I always look forward to Friday in SL, a day a few new sale items appear at different places. Today did not disappoint. Elate delighted me with a new dress, and new earrings! Both which I had to grab up immediately and do a quick (by Catty standards, that means published by Monday) post. Mesh clothing is gradually taking hold of me, and this new dress Kellie Iwish has out has been added to my list of must have mesh. It’s cute and fits so well, perfect for fall days. The alpha layer needs a tad of adjusting for my shape, but it does come with 3 options too for that so hopefully you’ll find one that works for your shape. I love the earrings too that Kellie also has out new, I am sure they will be very well worn in the future, I love a big hoop! I threw on a fave pair of boots from Maitreya, also mesh, along with my Go To skin of late, Cassiopea from Glam Affair, and I was set for some shopping and visiting, and even some dancing. That’s all for this quickie..and it’s even done and still Friday!!! Yay me! *waves* See you soon! Girlfriends Gone Shopping!! Starting 2012 on the Right Foot with Skins!! With the holidays over, it’s time to settle back into SL, get some blogging, shopping, sorting, socializing, etc done. I was delighted on Saturday to hear that Hey Girlfriend!’s very own talented Sachi had worked her artistic magic again, this time with a delicious new skin named after our lovely Harper. Jeni and I rushed right over to try it out. Sachi, being the sweetie she is, has a gift set out, so when you demo Harper, you’ll get some yummy make ups. As you may notice, our Jeni was so excited about it all that she just had to show us some of her many talents, with a little help from the goofy grid. Earlier in the day someone in the group mentioned shoes. I’ve been looking around for new shoes and boots lately so I tp’d along to SLink. I hate shoes, RL and SL, I’m so finicky when it comes to look, color, fit etc I just could pull out my prim hair. The grid was giving me grief, so I haven’t yet been able to try on demos, but I did grab a nice pile to try on when I can. I’m sure you’ll be seeing some SLink shoes here in the near future, I do love their quality. It was so fun to see a few Girlfriends out, tho I wasn’t able to get pics of others that showed up, I did of course get Jeni and I, as well as AmazingGrace as she was slinking behind the shoe display. We really do need to get the group out having more fun…and hopefully, you’ll get to see some of us here in the blog as we adventure about. And maybe even I’ll have shoes on…if I find some new ones. Back to shopping and whatnot, see you again soon. Oh, and have a very delightful New Year!!! For more info on what others might be wearing, see Flickr, where I have tried to tag what I can. Summer has gone so fast, I was caught by surprise when the weather guy announced the official end to summer. In an attempt to jump start my blogging, I thought I’d start with some favorite purchases, from the summer, that make great looks for autumn too. Seems like only a few days ago I purchased this yummy shirt from League, and I can’t seem to take off this Truth hair, purchased at a past Colabor88. With Autumn here so soon, that of course means there is more shopping to do, and that means more blogging! See you again soon!! It’s been a busy busy rl summer, and now the visitors have gone, the travel is done and soon school starts and I’ll have more time for SL’ing and blogging and creating and such. I decided it was time to start getting things back to “normal”, but wasn’t sure where to start today when I logged in, so many hunts going on and events, and I’m so behind on everything. I decided to do a bit of the Ocio Xtreme Hunt, and I love the shirt Cynful has out for it, so I paired that with a fave pair of jeans from Fri.day and a fun new hair from Shag that I don’t think I’ll be taking off any too soon. 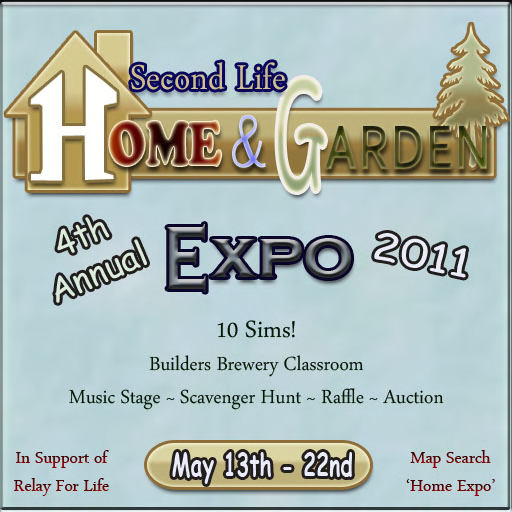 Second Life’s RFL events of 2011 continue with the annual Home & Garden Expo. The event began Friday, and runs through Sunday the 22nd. This year, 117 designers will be showing off their wares on 10 sims. Each designer has something new and/or specially created for RFL, and 100% of the proceeds will go towards the donation. 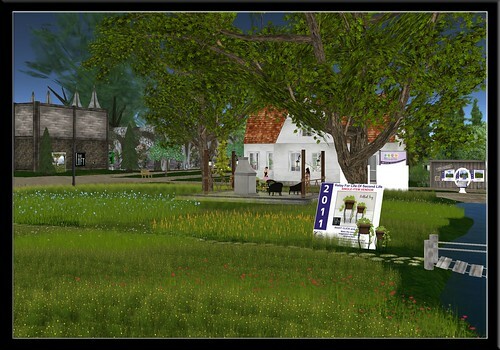 Imagine 10 Sims filled with some of the best SL has to offer for home and garden related builds, and you have the 2011 Home and Garden Expo. You can wander from vendor to vendor, checking ot each designers donation items – each offers an item or more, for donation for RFL. Take time to explore the builds, wander around and enjoy, or even move in for the duration (that is if you can choose a favorite spot!). 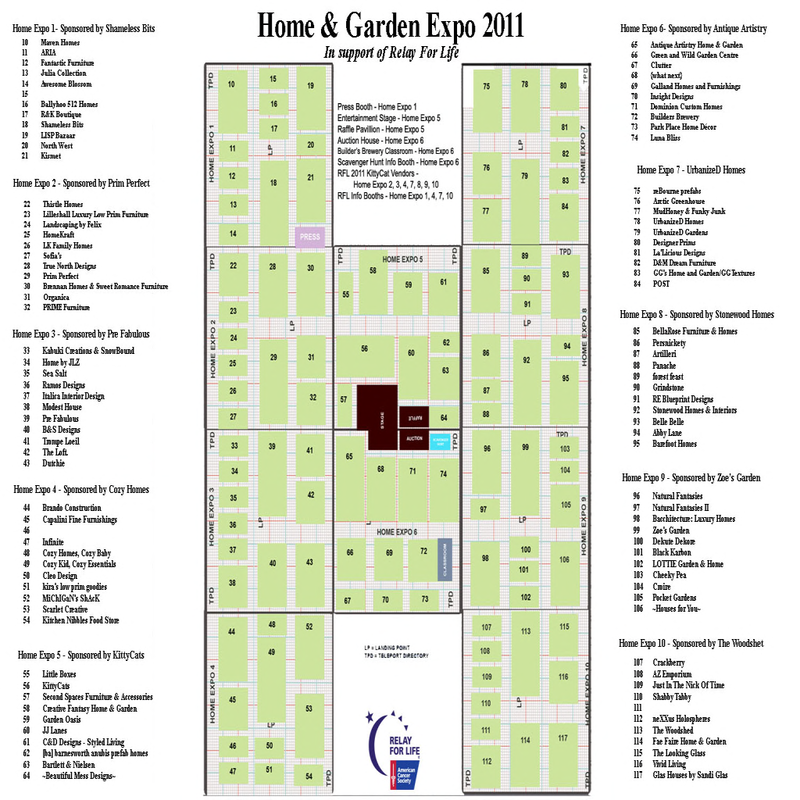 Home Expo is loaded not only with lush garden and inviting home builds, but events to keep everyone entertained. There are various classes offered thru Builder’s Brewery if you’d like to wet your toes with building. Each day offers a line up of various musicians and DJ’s, sure to guarantee music to suit everyones taste at one time or another. There is a Scavenger Hunt for those that like that type of thing, with items donated by various vendors, and a donation price of 25L for each of your finds. There is less then a week left, so don’t wait much longer to get over and enjoy some of this to good to miss event, and once you go you’ll likely want to go back again and again so as not to miss a thing. You’ll not only feel better by giving back, but you’ll just feel better spending time in the atmosphere provided by some of Second Life’s most talented designers. My Friday started with checking the Friday sales sheets, and I was filled with glee to see League and off I went, my shopping had begun. I immediately grabbed up the new Siara shirt and ran home to try it on. League is one of my top fave stores ever, so it always makes me happy when they have new stuff, especially if its on sale. I love the texturing of the wrinkles on the Siara, they are so touchable and have a much softer feel to them then the usual SL wrinkles, and the ribbon belt and bow sits just perfectly. It’s available thru today, in two colors, for 50L for Fifty Linden Friday. I suggest you do not miss this chance to get this amazing shirt at a steal of a price. I paired it with the Beach Skirt in Navy, from Sn@tch, a fave I’ve been finding myself wearing more then not lately. Another weekend sale item, too cute not to mention, is the Pretty Little Things Dress from Magoa, available thru the weekend at Disco Deals. It’s a soft and flirty pretty little thing and I found myself wearing it for part of the day as well. You’ll want to get over and check out Disco Deals too and grab this while you can. Jeni was also enjoying wearing the Magoa dress, and I took the opportunity to steal her shot from her Flickr (don’t tell her) so you’ll all be able to see yet another view of the Pretty Little Thing!! I’ve been excited for the Royal Wedding since the engagement was announced last fall, I remember getting up to watch Princess Di’s wedding with some British friends, so didn’t want to miss William and Kate’s. I loved every moment of it, and I’ve spent way too many hours since watching all the coverage going on here in the US. While enjoying watching the wedding, and all the hats and such, I got to wondering…what would I wear to the Royal Wedding if I’d been invited? Well, without a second thought, it would have to include a Hatpins hat, as I’ve watched designer Reghan Straaf’s mad millinery progress since her very first hat, years ago, and I am proud to say she is one of my dearest friends and has been since our earliest days. Her hats are exquisite and would be very highly suitable for a RL Royal Wedding. Then I wondered, what else would I wear? Well, I spent hours sorting thru existing inventory, and failing at coming up with anything that felt right. They have so many rules on what is proper!!! I never did decide on anything and eventually got caught up in RL. Much later, I was given the opportunity to blog Magoa’s Project Themeory item, and when I saw it, I knew I wanted to wear it, with a Hatpins hat, to the Royal Wedding! I love the color, which matched the idea in my head of what I’d been looking for. It’s quite improper, with its bare arms and all, for a Royal Wedding; I’d choose a classic jacket, in black, to wear with it, but I didn’t want to hide the lovely color and texture for this post. The dress comes with a second skirt option, which contains some words of love on the skirt, which goes along with the Project Themeory theme, but I opted for the plain option for my wedding attire. I also got wind of the Mynerva Birthday Hunt happening, this weekend only. There are five hidden cupcakes, each with a skin, for group members and there is a fee to join. I love particularly the Adele skins, which you get in two tones, and the Night Drow, which I hope to blog in the future. This little hunt is definitely something to do while waiting for previously posted weekend events to get started, don’t wait to long since it ends soon. Beware tho – you will risk wanting more of these skins if you aren’t familiar with them already! Incidently, I was wearing the Elikatira Past hair when watching the Wedding coverage, and when we all finally got to see the Bride’s chosen wedding look, I was thrilled to see she’d chosen the same Elikatira style too!! I loved everything about her look, as well as Pippa’s and the Queen’s. Some of us in Hey Girlfriend! were up chatting while watching and that made it even more special for me. I wish William and Kate a very happy and blessed life together, and am so grateful we all (I even woke my MiniMe in time to catch some of it too!) got to share in their joy of the day.